Here’s where you can find out the name(s) of your Block Captain(s). 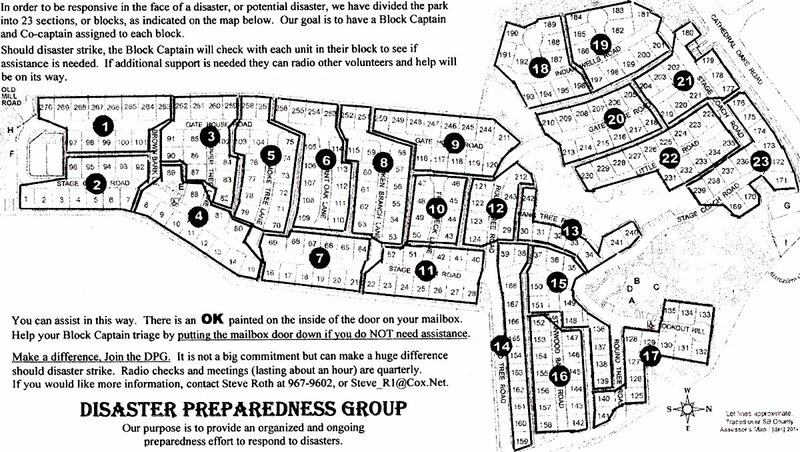 Below are lists and a map of current Block Captain volunteers in our community (organized by street blocks and unit numbers) who can offer guidance and assistance in the event of an emergency. 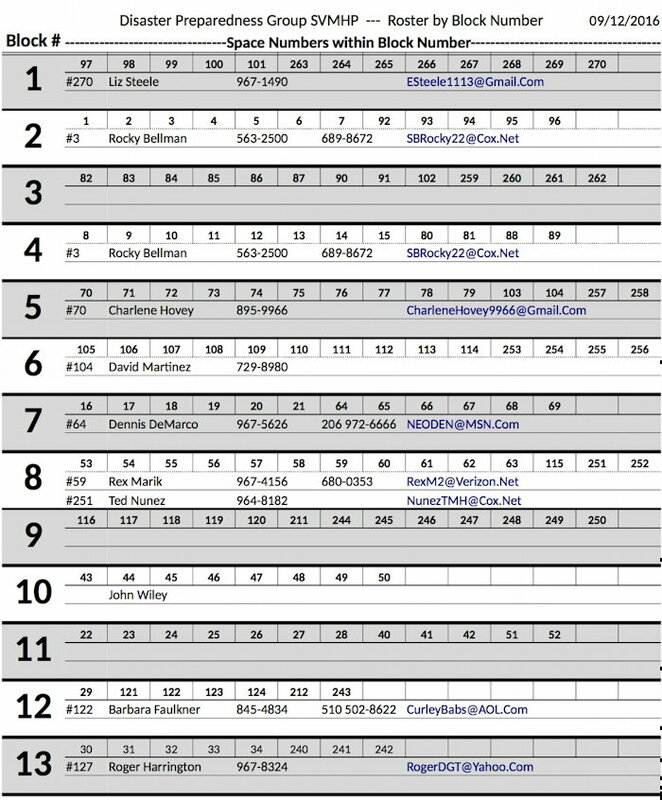 To find your Block and Captain just look for your SVMHP home address number, find your Block number, and note the name and address number of your Block Captain(s) if any. 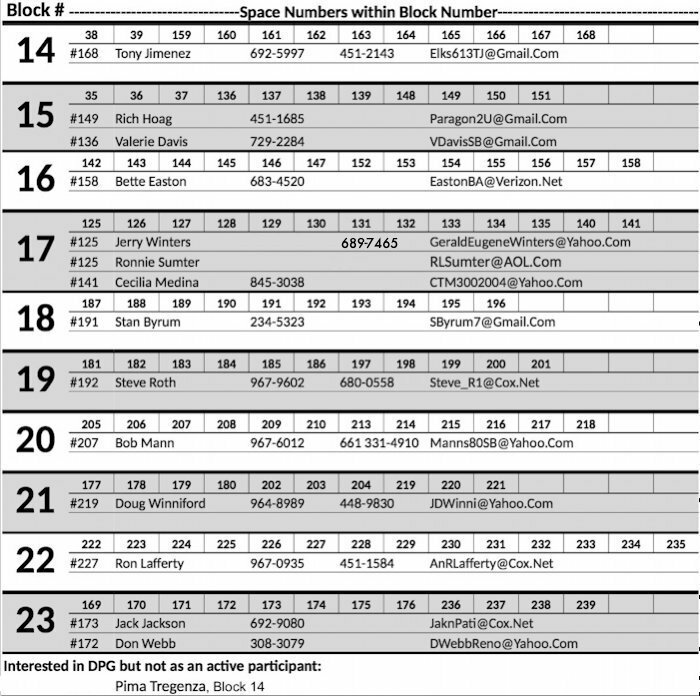 For example: If your SVMHP address were 97, you’d find it first in the list of addresses across the top row for Block 1 and note the Block Captain name and unit number in the second row for Block 1. If your address is unit 239, you’re in Block 23 and your Block Captain is Jack Jackson in unit 173. Note that from time to time some Blocks may not have a Captain, so please consider volunteering to help your neighbors after you’ve taken care of your property and loved ones in event of an emergency. You may want to make up an emergency card with the name and number of your Block Captain to place where you can find it in an emergency. You could also print this entire page or some/all of these lists and map now to keep handy. To see the largest version of each item below, click on it until it doesn’t get any larger (then print it if desired).